Are you looking for apps that will encourage kids to read, and to enjoy reading? 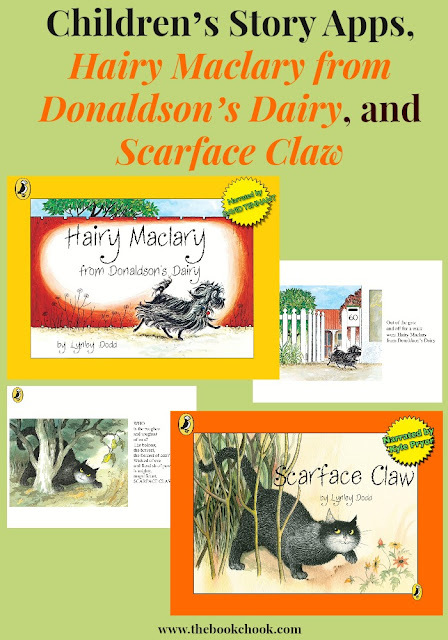 Here are two from world-famous author and illustrator, Lynley Dodd: Hairy Maclary from Donaldson’s Dairy and Scarface Claw. I have previously reviewed Hairy Maclary, Scattercat. • Personalize each book with ‘this book belongs to ...’ page. • Swipe-to-Read™ the words to hear and playback the story at your own pace. • Touch-to-Hear™ individual words spoken. • Touch-to-Spell™ to hear the letters that spell each and every word. • Auto Play to enjoy the narration. • Use the My Narration function to read and record the story yourself and customize your book. • Paint mode can be used on each story page! • Paint has a paint palette, brush width, move and zoom, and undo abilities! • Tap the paint palette icon and tap a color to change the paint color! • Tap the brush palette icon and change the slider to change the brush size! Both these story apps have the balance between Story and special effects just right. Story should always be paramount, something I wish more movie directors could learn! Lynley Dodd’s stories have been beguiling generations of children for many years, so I love that developers, Kiwa Digital, have come up with another format to continue the tradition. Yes, children can touch Scarface and hear him miaow, but the bells and whistles are at a minimum, allowing the story itself to shine. Dodd’s illustrations are just as lively and lovely in an electronic version! Kiwa have taken advantage of the interactivity that’s possible in a digital tool: while kids listen to the story read aloud, the print follows the narrator’s voice, lighting up each word as it’s read. I believe this develops phonemic awareness, helping kids see the sound to symbol correspondence. I enjoyed the narrator voices for both stories. David Tennant narrates Hairy Maclary and Kyle Prior narrates Scarface Claw. The slight Scot’s burr added to the charm for me. Kids will love the extra activities too. They can colour in pages from the books and share them, record themselves reading aloud, and touch one part of an illustration to get a response. Parents will be thrilled that Hairy Maclary also has a sign language feature, and also with the fact that there are so many more books by Dodd available. Like all apps, children will get the most from these by sharing them with an adult. They would be great to load on a phone/iPad for those inevitable queue moments, and make excellent companions to their print counterparts. Check out all of my iPad App Reviews on Pinterest, and find more apps and articles via my Listly page. I’ll be adding both these apps to my List of Charming Children’s Story Apps which is embedded below.